March 29, 2015, So If You Killed My Child, You Think You Are Strong? One of the greatest casualties of the ongoing war on Gaza is childhood. 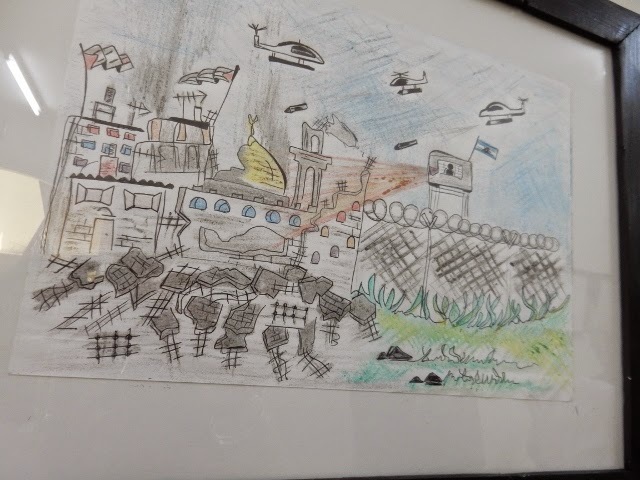 The Gaza Community Mental Health Program Deir al Balah Community Center has an extraordinary exhibit of post-war children’s drawings that gives us a window into the loss of the sense of order and safety that comes when one of our smart bombs lands in your bedroom. The delegates stare, take photos and are pulled into each drawing; some of us are weeping, some of us just floating in a sea of societal trauma. 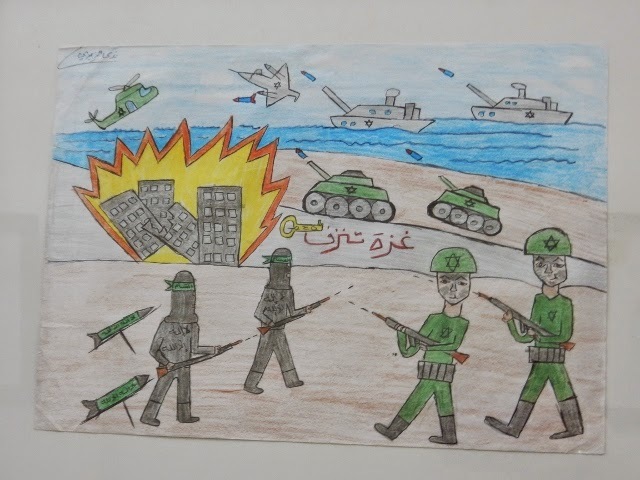 Children chained together in front of a soldier with a whip, families lined up in front of a tank, bombers shooting birds out of the sky, pools of blood, lots of blood, bloody circles on people’s chests, over and over again, fallen trees, smiling men in kaffiyas waving the Palestinian flag, a dove holding a circle of wounded people facing a missile, apache helicopters dropping bombs, walls crumbling and crumbling, neatly drawn piles of rubble, fires, ambulances, more dead people, doves the color of the flag dripping with blood, lots of blood, naval boats bombing from the sea, tanks, planes, and soldiers with prominent stars of David, curled barbed wire, missiles landing on vegetable trucks, more tanks and planes and fire and people lying on the ground bleeding, four boys on a beach flying kites with bombs falling on their heads, a heart with the word Gaza written across it in black, white, green and red, split in half, pierced by two missiles bearing the Star of David. Not only am I appalled by what these children have witnessed, but I am sickened (once again) that in this world, the Star of David is synonymous with military violence, grief, and death. Our next stop is at the extraordinary Atfaluna Society for Deaf Children, a Palestinian NGO for Deaf Children in Gaza City working in the field of deaf education, vocational and community training since 1992. Atfaluna is Arabic for “our children” and the center focuses on academic education for deaf students who were traditionally hidden away by their families and treated as mentally defective, and the building of human and vocational skills to prepare students for productive and independent lives. They are famous for their gorgeous embroidery and furniture making program and we thoroughly investigate their craft store and make our contribution to the Palestinian economy and the school. They report a dramatic increase in hearing loss in babies born since the last war. A scientific study needs to be done, urgently I might say. Reema explains that the children participate in much of the building with recycled wood, there is a lively art room, a family pays 10 shekels a year. Reema believes in setting clear rules (these are children whose lives have turned upside down) and providing a clean, safe space, and at the same time, this center is a home; she is addressed as Auntie. The center is open for all citizens, not just refugees. We wonder how she keeps her focus and her strength, so much has been accomplished in such a short time. She admits that she does get depressed and angry, fights with her friends, shouting and then apologizing the next day. She goes to the sea to relax. Reema’s next dream involves turning a 1700 year old monastery with a mosque downstairs in Deir Balah into a garden and children’s library. We drive to the ruin which is in a very poor area and she is obviously animated and planning for the future. The children have cleaned the ancient stones and arches, the Ministry of Tourism has signed an agreement, money for restoration is being collected, and she is in contact with UNESCO for the restoration. The major difficulty is the lack of cement in Gaza which made donors a bit hesitant. Reema says defiantly, “I am stubborn like a donkey, this is from my father’s side.” The monastery is a mosque and a monastery and thus a reflection of the message of tolerance at the arts center. Reema complains that UNESCO asked her to get the building materials for the restoration. “Don’t ask me to get cement for Gaza!” And you just know that she will make this incredible project happen.